Robin van Persie said he had listened to 'the little boy inside him' when deciding to join Manchester United. The Dutch superstar will wear the No 20 shirt after completing his £24million switch from Arsenal. He has signed a four-year contract worth an incredible £250,000 per week - the same terms handed to Wayne Rooney two years ago. Speaking at his official unveiling press conference, he said: 'In these situations, when you have to make a hard decision in your life, I always listen to that little boy inside me. What does he want? That boy was screaming for Manchester United. 'Everyone knows me by now. I love football. I am quite principled in that perspective. It is always difficult to find the perfect match but I do feel this is the perfect match for me. The 29-year-old was then taken to United's training ground at 9am to meet his new team-mates and sign the astonishing £250,000-a-week deal that will give him parity at the club with Rooney. Van Persie then trained with his new club and is expected to go straight in to the team for the season's opener at Everton on Monday. 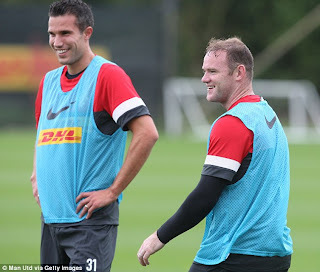 Sir Alex Ferguson said: 'Robin is a world-class striker with a proven record in England and in European football. 'His talents need no introduction to our fans – he has scored a number of goals against us in some classic battles with his former club. His movement, finishing and all-round ability are outstanding. Ferguson admitted he thought it would be impossible to get Van Persie to sign, but had to make an attempt when the striker did not sign a new contract with the north London club. 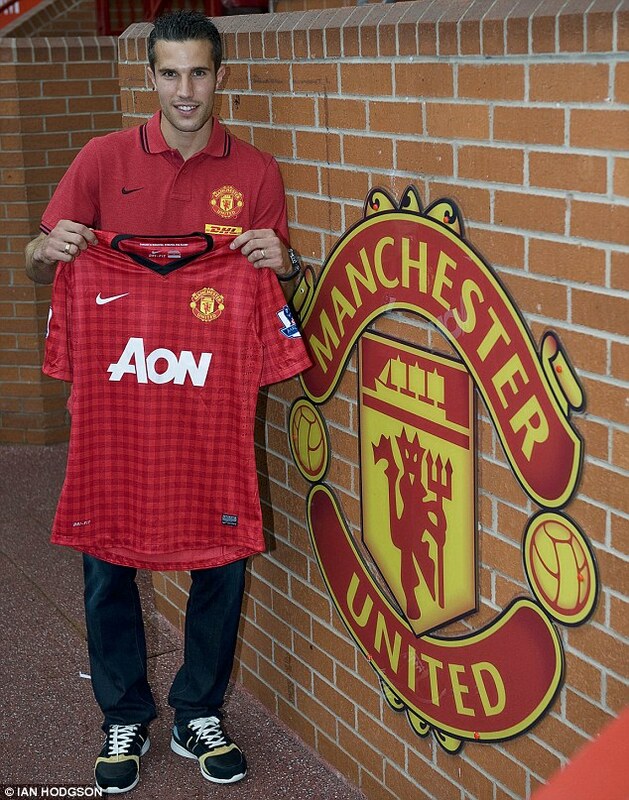 At the press conference, Ferguson added: 'We never thought we could get Van Persie. If you go back six months ago, I couldn't see us getting him. Even so, it took a personal intervention from Ferguson to get the deal moving last week after it had apparently stalled permanently. 'I can't elaborate but it was amicable,' said the Scot. 'Arsene knew the boy wanted to leave. He knew he wanted to join us. That made it a bit easier but not in terms of trying to reduce the fee. Ferguson revealed he was still looking at a new signing for 'one more position' but 'only if a certain player came available'. Van Persie is the first Arsenal player to join United since Viv Anderson in 1987 and the move has riled Gunners fans, who took to Twitter to abuse him. United are understood to have agreed a £15m downpayment for last season’s Footballer of the Year and Players’ Player — who scored 30 Premier League goals for last season. That will rise to £24m depending on appearances. Van Persie is expected to sign a four-year contract worth over £200,000 a week. 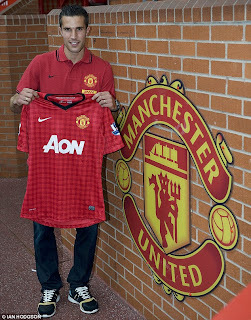 In signing Van Persie, United manager Sir Alex Ferguson has laid down a clear marker ahead of the new season. It is the first time the club have paid for a big name since Dimitar Berbatov from Tottenham for £30.75m in 2008.